Do you speak Crosswordese? When you lose a button from a shirt and can’t find the sewing kit, do you ask your partner where the etui is kept? Might you sometimes mischievously refer to margarine as oleo? Have you ever stridden into a church just to point out what a great apse it has? I started a life of crossword-solving as a teenager, almost three decades before my first novel, Black Chalk, was published, and I give credit to the world of puzzles for helping foster my interest in language. But crosswords are about more than accumulating words: crosswords are about having fun with words; crosswords are, in fact, about loving words. See, crosswords encourage you to play with language. And, as a novelist, I get to play in the sandbox of words every day. But more than just aiding in a love of language, more than just encouraging you to have fun with words, crosswords also stimulate skills such as lateral thinking, humor, and synonym use. 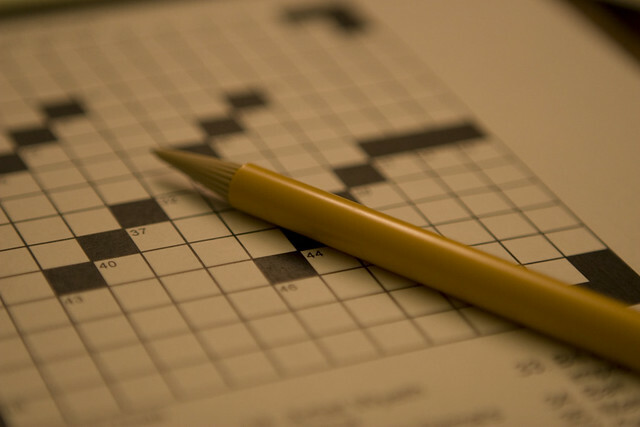 You could say that crosswords are the ideal training tool for a novelist. But the ways in which puzzles have affected my life as a novelist go deeper than the mere enjoyment of solving crosswords. In my early 20s, having discovered that I absolutely loathed Law (the subject of my college degree and subsequent training, and the area in which my parents wished me to work), I needed to find a job. I had known for some time that I wanted to be a novelist, but at that tender age I think I felt too young to write fiction. (And I know I felt considerably too scared.) So instead of turning to novels right away, I got a job in another area I loved: puzzles. And for years, I edited and compiled all sorts of puzzles — crosswords, logic problems, word searches, sudoku, riddles, spot the difference…How could all of this fail to leach into my fiction? If Black Chalk reads like a puzzle (and many reviewers have stated as much) then it is as much because of my work in that field as it is because I enjoy challenging myself — I really do like tormenting myself with plot problems, it seems. As a writer you sit on your own in a small room for a very long time — and one of the ways I like to keep myself entertained, it turns out, is by constantly pivoting and twisting my plots like the pieces of a Rubik’s Cube until I come across a pattern I find particularly pleasing. It feels to me that staring at the blank page is a lot like staring at a blank crossword grid. When I make up a crossword, I have, say, a theme and 10 or a dozen answers that I want to place in the grid. And when I set out to write a novel, I have a theme and 10 or a dozen plot points or developments that I want to place in the story. And so the challenge, in both cases, becomes one of getting everything to interlock, of making everything work together, a matter of filling in the gaps in the most pleasing way possible. Because, let’s face it, what better way is there than solving puzzles to stave off the feeling of…I’m stumbling for the right word here…It’s something like boredom…Dammit, I’m supposed to be good at synonyms…Ah, that’s it: ennui. Christopher J. Yates was born and raised in Kent and studied law at Oxford University before working as a puzzle editor in London. He now lives in New York City with his wife and dog. Black Chalk is his debut novel. I’m a long time lover of crossword puzzles and I totally relate. Really enjoyed this. Thanks. We got back late last night from Los Angeles (where we had attended the wedding of two great friends), and are now wading through stacks of boxes in our still freshly moved into apartment in Philadelphia. Unfortunately, it turns out that when you go on vacation two days after moving, you don’t return to find all of your things miraculously unpacked and where you want them to be.However, after a few days of catch up (and thanks to the resourcefulness of Mrs. Millions) we should eventually approach normalcy. As for the digital realm, I still have many emails to respond to and my Bloglines “unread items” number in the thousands, but regular posting will ramp up again here over the next couple of days.In the meantime, I noticed that Philadelphia announced its 2007 One Book, One City selection this week Carlos Eire’s Waiting for Snow in Havana: Confessions of a Cuban Boy, a National Book Award winning memoir. It tells the tale of Eire’s boyhood uprooting from Cuba and the subsequent “rootlessness” of his life in the United States. The selection puts the focus on our country’s immigration issues, though the question of Cuba has been less “hot button” of late. I, for one, prefer to “One Book” programs select fiction as I think there is something more special about a whole city reading a novel together. And anyway (though I read as much non-fiction as fiction), fiction is more in need of support from our public institutions. However, some consolation can be found in the fact that Waiting for Snow in Havana is literary and not just topical.